Battle of the Damned is almost incredibly fun, but winds up as bad as you anticipated. 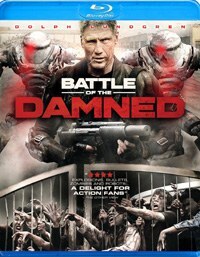 Battle of the Damned is like watching an updated version of John Carpenter’s classic Escape From New York, except with zombies, and robots, and Dolph Lundgren. For a time the movie is exactly as much ridiculous fun as this description makes it sound. But as is often the case with cheap, direct to Blu-ray fare like this, the absurdity wears thin and you’re left to rely on things like story and character, and there is very, very little of either going on here. Writer/director Christopher Hatton doesn’t waste any time throwing you into the mix. In an unnamed Southeastern Asian city, unregulated biotech companies have unleashed a plague that turns people into rabid cannibals that very much resemble zombies. Except you don’t have to shoot them in the head and can kill them much like any normal person, so there’s that. Fortunately the disease was contained, and only this one city has to be quarantined. That’s actually the most unique aspect about this movie, that this is localized and that there’s not a worldwide pandemic going on. This is all explained in the opening title cards, and mere seconds in, you’re right there with Major Max Gatling (Lundgren), and his ever dwindling team, killing zombies, trying to find the daughter of a the head of the biotech firm responsible for madness. You’re not sure how exactly he’s a Major, because Gatling is pure mercenary badass-for-hire, and his mission has to be kept a secret from the actual military. Don’t think about it too hard, this is just one of many, many unanswered questions in Battle of the Damned. You also can’t help but feel a little bad for Lundgren here. Not because he’s been reduced to making this sort of substandard genre horror, he’s always done that, and that part is super rad. But when you see him shuffling around the streets that alternate between being completely deserted and infested with zombies, you realize that this is a man pushing 60, and that he’s spent much of his life being very hard on his body. There’s even a scene where he fights off the undead while handcuffed to a light pole, and you’re pretty sure it’s only included so they could have an action scene without having to make Dolph run any more than necessary. The undead street battles are fun enough, and there’s a post-apocalyptic feel to the schlocky action that keeps you interested. When Gatling finds the girl, Jude (Melanie Zanetti), who happens to be with some other stranded survivors, things take the elevator straight to the basement. The dialogue is… weird, and there’s an uncomfortable gender dynamic that, intentional or not, leaves you scratching your head, and a little skeeved out. Jude is a tough in her own right, dressed in black with face paint and lugging around a sawed off shotgun. All of the other women, not so much. The guys are all dressed in full battle garb—which makes them look like they’re playing a rousing game of laser tag. Of the two other women, one literally walks around in nothing but a lingerie nightgown, while the other constantly jogs in a bright pink sweat suit, because, I guess, she wants to keep up her figure after the apocalypse. The leader of the clan, also named the Duke (David Field) if you needed another reason to think of Escape from New York, keeps them not quite under lock and key, but pretty damn close. You’re not sure if this is a conscious choice intended to prove some larger point, but considering there doesn’t appear to be any larger motives in play, you can rest assured that this awkwardness is the result of bad writing and poor storytelling. Things just happen with little to know reason. When one zombie dies he falls against a car horn, Gatling’s radio goes off when he’s trying to hide, and, of course, then there are the robots. Seriously, there are robots. They show up out of nowhere, looking like rejected Cylons from Battlestar Galactica, and for some reason they malfunction in just the right way that they want to kill zombies in a digital berserker rage. But it’s okay, Gatling speaks their language and forms a weird bond with them so they’ll do his bidding. Huh? It’s a bizarre scenario to be sure, but one that, at least momentarily, distracts you and hurtles you back into the strangeness of the early portion of the movie. Battle of the Damned gives a half-assed excuse for inserting the robots, it leaves big questions hanging—you never have any idea how long this has been going on, sometimes it seems like it’s been going for years, others a few weeks—and the story is barely coherent. It could have been a fun piece of DTV horror-action, but winds up being as terrible as most of you probably expected. If your hopes have been dashed because you were anticipating something spectacular, sorry, that’s what you get for having hope. The Blu-ray of Battle of the Damned doesn’t do anything to sweeten the deal. The look of the film is a muddy digital wash of grays, and the only bonus feature is a six-minute collection of behind the scenes footage. There’s no context, no interviews, no voiceovers tying it together, this is just video someone shot during production. You do get a feel for how the cast and crew made the most of what was surely a limited budget— they filmed with the camera on what is essentially a local pedicab—but that is of little interest.